The stock market's advance is immortal--isn't it? You know the drill: the Federal Reserve will never let the market fall, never, never, never: it will continue to loft higher for all time, in immortal glory. Like a blood-sucking vampire, the market is parasitically feeding off the real economy. As the host weakens, the parasite increases its control. Now the market is telling the real economy: if I die, you die, too. The entire Status Quo is now utterly dependent on a rising stock market: not just for the illusion of the wealth effect, but for tax revenues, pension fund stability, and the fantasy that a rising market is a substitute for a healthy economy. It's terribly frightening to be in thrall to a parasite that will bleed its host dry to maintain itself. But that's not the scariest possibility. The scariest possibility is that the stock market will fall despite all the promises that its advance is immortal. If this were to happen, all those "safe" index funds would implode along with the broad market. Thank you, Simon L. ($50), for your monstrously generous contribution to this site -- I am greatly honored by your support and readership. Thank you, Randy I. ($10), for your much-appreciated generous contribution to this site -- I am greatly honored by your support and readership. Those calling for an end of the Empire don't seem to realize that the federal state's vast entitlement programs are ultimately funded by the Empire. The Status Quo would have us believe that America and its Empire are one entity. 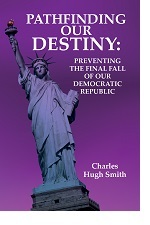 This is handy for those with Imperial designs but it is false: America could be untangled from its Empire, and many of us believe it is essential that America untangles itself from its Imperial structures and ideologies. What I call The Imperial Project was cobbled together in the aftermath of World War II, when the Soviet Union and America posed an existential threat to each other's ideologies and systems. It may be hard to believe, but the U.S. did not have a Central Intelligence Agency (CIA) or other espionage/intelligence gathering agency prior to World War II. America had no spy agency and no Black Operations/Special Forces capabilities. The National Security State as we know it today did not exist. Though the Deep State has long been an essential feature of the American power structure, the post-war Deep State extended its reach globally in ways that the pre-war Deep State could not. Many people naively think all that's needed to end the Imperial Project is close America's overseas military installations and end the endless wars of choice. While the eradication of the neo-conservative Imperial agenda would be a welcome first step, it would only be a first step, as I explained in You Can't Separate Empire, the State, Financialization and Crony Capitalism. To untangle America from its Imperial Project, we also need to end financialization and crony-state-capitalism, both of which are key features of the Imperial Project. what better way is there to extend influence than exporting inflation and offering limitless credit in U.S. dollars? What better way to skim the profits from trade than importing materials and goods and exporting fiat currency? Those calling for an end of the Empire don't seem to realize that the federal state's vast entitlement programs are ultimately funded by the Empire: not directly, but indirectly via its ability to foist trillions of dollars of debt on the world economy. The believers that hot wars are all there is to the Imperial Project fall silent when their share of the swag might be threatened. Unsurprisingly, we want the financial benefits of Empire but recoil at the entanglements of Empire. Imperial Rome offers a useful template for what happens when the domestic populace gets dependent on Imperial wealth: the notion of sacrifice for the nation goes out the window and bread and circuses become the sole source of state legitimacy. Needless to say, collapse follows these developments like night follows day. For America to come home and untangle itself from the Imperial Project, it will have to do more than not meddle in everyone else's affairs; it will have to learn to live within its means--what it earns from producing goods and services, not what it skims from global financialization. Thank you, Keith S. ($25), for your wondrously generous contribution to this site -- I am greatly honored by your support and readership. Thank you, Chris A. ($20), for your much-appreciated generous contribution to this site -- I am greatly honored by your support and readership. We're all minions now of the stock market. The all-powerful Federal Reserve is a mere minion of the stock market, a kitten absurdly claiming in public to be a tiger. 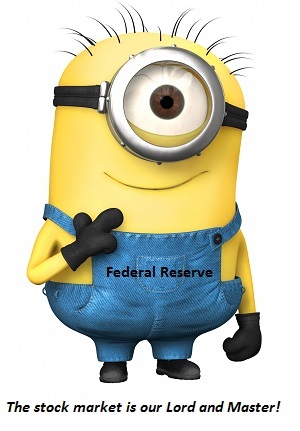 If the market threatens to drop, the Fed quickly prostrates itself and does the bidding of its Lord and Master: "No rate hikes, minions!" By cowering in terror of a stock market tantrum, the Fed has surrendered everything: its vaunted (and completely phony) independence; its duty (yes, go ahead and laugh) to the nation and the real economy--everything. 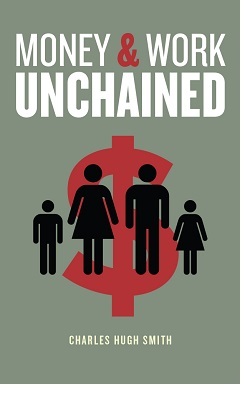 The Fed is nothing but an abject slave of the market. It masks its servitude with Newspeak, but the reality it has only two choices: burn the market down with a series of rate hikes or surrender completely to the market, relinquishing any pretense of power or control. The Fed is not alone; the entire financial-political system is now beholden to the stock market. Want to impose real restrictions on the financial sector? Forget it, Congress--the market will rebel. And if the market sags--you'll cave in like all the market's servile minions because a significant chunk of your campaign contributions come from those profiteering off the market. Corporate America--don't dare miss your quarterly earnings number or you will suffer the wrath of a market that destroys all who don't obey its demands for short-term profits at the expense of long-term profitability. Were the management of a public company bold enough to sacrifice short-term profits for long-term growth, they wouldn't survive the market's destruction of their stock price. 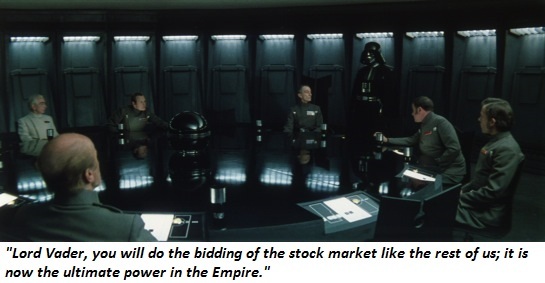 The stock market now dictates fiscal and monetary policy within the Empire because the American economy has been fully financialized. Profits flow not from innovation in products and services but from the financialization of every income stream. When the profits from financializing collateral and leveraging those bets to the hilt far exceed generating wealth by creating products and services, the economy is soon hollowed out as the perverse incentives of financialization start driving every business and political decision and strategy. We're all minions now of the stock market. All hail our Lord and Master, the stock market. Thank you, Curt A. ($5/month), for your splendidly generous subscription to this site -- I am greatly honored by your support and readership. Thank you, Verna C. ($5/month), for your superbly generous subscription to this site -- I am greatly honored by your support and readership. The net result is nonsensical policies that fail to achieve their stated objectives. We live in an era of illusion: the illusion of understanding, and the illusion of control. Few institutions reflect these illusions better than the Federal Reserve, though the Pentagon, Congress, the Imperial Presidency, the sick-care cartel and the higher education cartel are certainly giving it a run for its money. The foundation of the illusion of understanding is data--Big Data. That the Fed has no idea of how the real economy actually functions is painfully apparent. But the state's vast flood of data, neatly organized into slop-troughs that suggest precision, creates a very compelling illusion of understanding: media shills go to absurd lengths to treat bogus or marginal data as the equivalent of the tablets brought down by Moses. Sorry, Corporate Media: the unemployment rate and the official rate of inflation are not real. They are illusions rigged to lull the masses and enrapture the simulacrum experts living high on the hog in academia, NGOs (non-governmental organizations) and think-tanks. 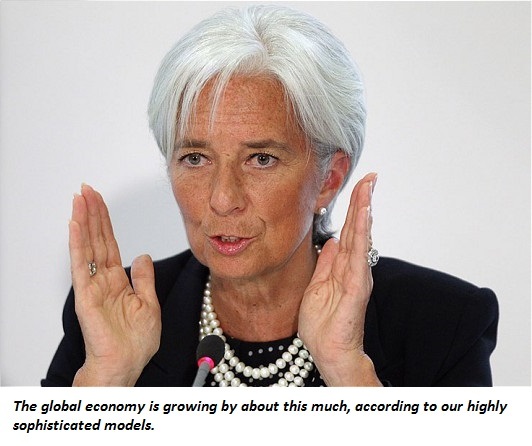 Here is the reality, as expressed by IMF Chairwoman Christine Lagarde: what passes for precise data is a guesstimate at best, and a carefully executed distortion at worst. The net result is nonsensical policies that fail to achieve their stated objectives.Even more tragicomic, the spokespeople tasked with presenting this failure to the Great Unwashed are forced to speak gobbledigook that borders on the psychotic if taken at face value. 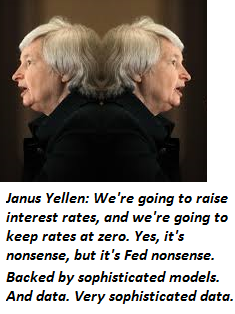 For example, Janus Yellen must claim she is planning to raise interest rates while also proclaiming that she's keeping rates at zero for the indefinite future.If a non-Elite person rambled on in this fashion, they would be tossed in jail as a 51-50 (involuntary psychiatric hold). Equally perverse is the illusion of control--the fantasy that the Federal Reserve controls the real economy. Note to Fed: hosting the financial feasting of the Power Elites for 7 long years had essentially zero positive effect on the real economy. All the Fed's QE and ZIRP (zero interest rate policy) accomplished was the inflating of multiple bubbles (housing, stocks, bonds, student loans, subprime auto loans, etc.) and chumming the feeding-frenzy of financiers gorging themselves on income-producing assets while the dwindling middle class has been mesmerized into accepting debt servitude as the acme of middle class membership. The notion that the Fed or the IMF understands the real economy is pure illusion. So is the notion that they control the real economy. All they control is the level of exploitation of the many by the few. Thank you, Venkatesh P. ($5/month), for your monumentally generous subscription to this site -- I am greatly honored by your steadfast support and readership. 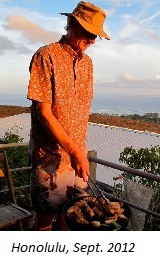 Thank you, Stuart L. ($50), for your superbly generous contribution (via Dwolla) to this site -- I am greatly honored by your steadfast support and readership. Here's a chart that shows how the Status Quo "fixes" every problem: it transfers more debt and more losses to the taxpayers. Many hold a touchingly naive faith that the Status Quo will save them even as the current system unravels. Why is this faith naive? Let's start with this key question: does the Status Quo strike you as being even remotely competent? If you answer "yes," we have to ask: what planet are you on? Mars? Here on Earth, no one that isn't a bought-and-paid for-shill of the Status Quo would even make the risible claim of Status Quo competence, except as a bitter joke. The Status Quo assumes we can't deal with the truth like adults, and so it sugar-coats every unsolvable problem with lies and false assurances. The Status Quo assumption is the Great Unwashed 90% will shoot the messenger, i.e. toss out our public leadership should they be foolish enough to tell us the truth: the promises issued to you cannot possibly be fulfilled. Not because of an evil cabal, but because the demographics and financial realities render the promises impossible to keep, regardless of who's in office. I'm going to get my Social Security, right? I wuz promised! 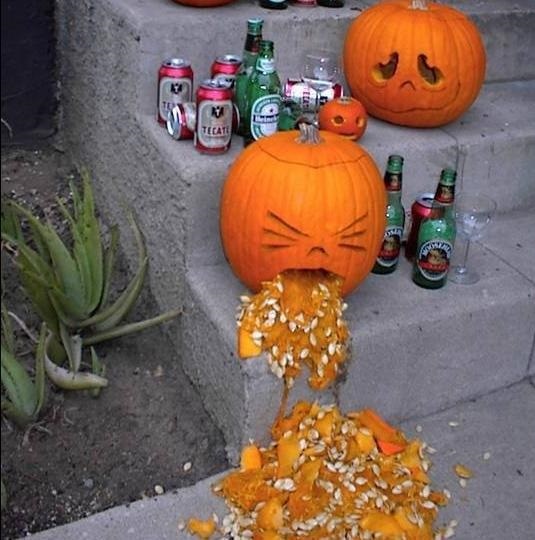 Don't be a chump, man. You'll get something that's called Social Security, but it will either be taxed to the point it only buys a loaf of bread or will only be worth a loaf of bread. So yes, you'll get Social Security, but not the one you were promised or the one you're imagining. I'm going to get my Medicare, right? I wuz promised! Sure, you are, pal. Just not the Medicare you're imagining, you know, the one that pays for everything. The stock market will never crash, right? Does this look like a stock market that will never crash again, or a stock market that's poised to crash again? Your answer is a measure of your gullibility and faith in the Status Quo's false assurances. 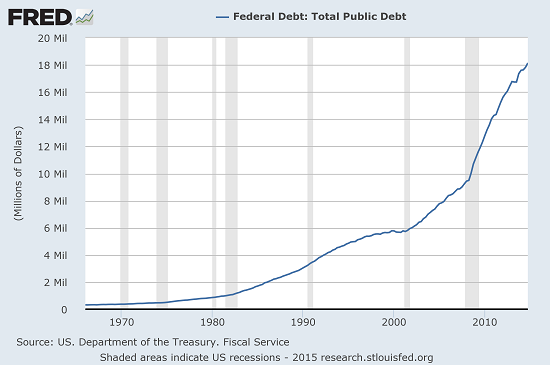 Does this chart of federal debt look remotely sustainable to you? Don't be a chump, man--it's clearly not sustainable, no matter what rationalizations the Power Elites' shills are bleating. 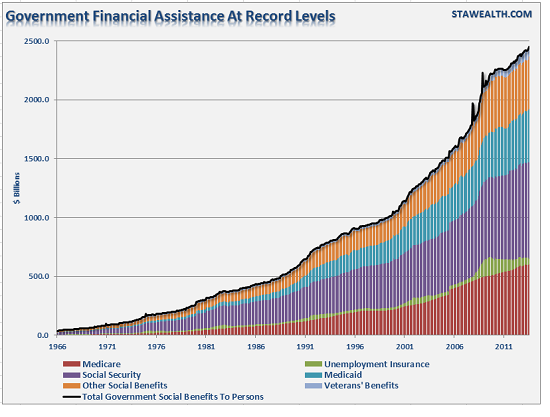 Here's a chart that shows how the Status Quo "fixes" every problem: it transfers more debt and more losses to the taxpayers. 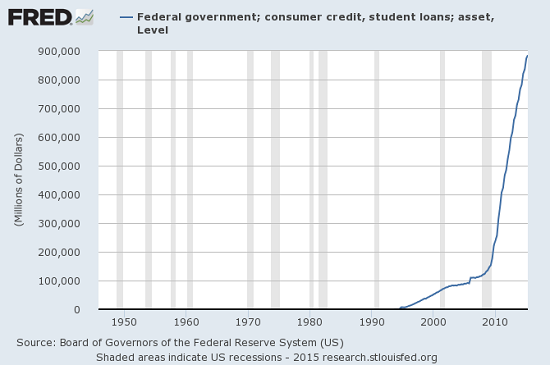 Student loans out of control and poised to implode? No problem--just transfer all the uncollectible debt (i.e. losses) to the taxpayers. If you believe that's an actual solution, I have a little 3-Card Monte game over here I'd like you to play until you have no more earthly (or Martian) possessions. Alternatively, just sink all your money into the stock market that's poised to crash. That will wipe you out just as effectively as the rigged 3-Card Monte game. 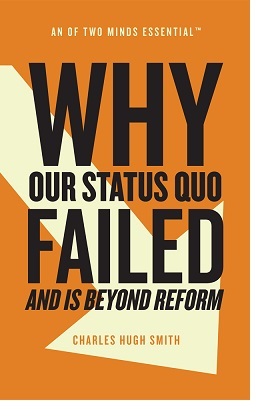 Don't think the Status Quo will save you, or make good on its vast multitude of promises. Naive faith in promises and fantasies isn't helpful in the real world. Thank you, Daniel K. ($50), for your monumentally generous contribution to this site -- I am greatly honored by your support and readership. Thank you, Douglas K. ($50), for your superbly generous contribution to this site -- I am greatly honored by your support and readership. Can the stock market completely ignore these changes and keep powering higher on the fumes of Mario Draghi's promises? Judging by October's rocket launch, the stock market is back to where it should be, i.e. in rally mode. Yee-haw! All it took to keep the party going was another rate cut in China, another "whatever it takes" assurance from Mario Draghi and blowout earnings from a few tech giants. 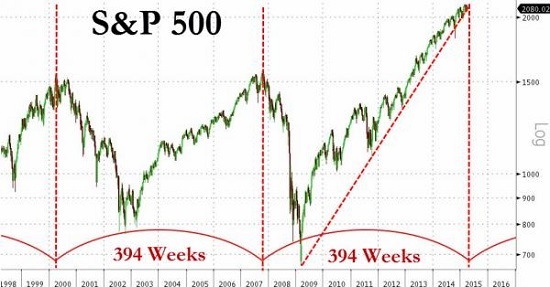 So we seem to be right back we we've been for seven years: more central bank easing triggers more stock market mania, and stock buybacks and "earnings surprises" push stock valuations ever higher. 1. China's expansion has ground to a halt. China's insatiable demand for commodities and capital has pulled the global economy's cart for seven long years. Now that this demand is faltering, there is no equivalent economic/financial engine of demand to replace it. 2. Income for the bottom 90% in the developed world is stagnant/declining.The most basic assumption of central bank monetary policies since 2008 (QE, etc.) was that household income would rise as the economy recovered, enabling more household consumption/debt. This has not turned out to be true: for a variety of structural reasons, income of the bottom 90% of households has actually declined since 2000 when adjusted for official inflation. 3. The "wealth effect" from boosting global stock and junk-bond markets has been very limited. 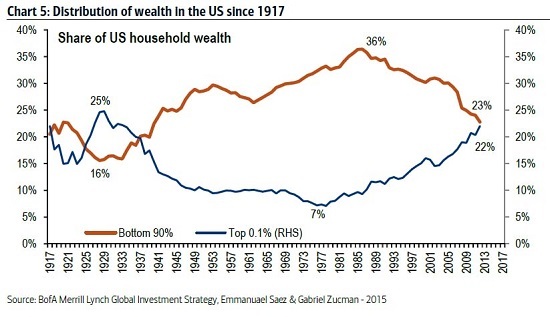 The second basic assumption of central bank monetary policies since 2008 was that the rise in financial assets (stocks, bonds and real estate) would "trickle down" to households who would respond to the psychological sense of increasing wealth by borrowing and consuming more. What actually happened was the assets of the bottom 90% were gutted in the crashes of 2000-02 and 2008-09 and in many cases never recovered. In terms of stocks, many in the bottom 90% decided against gambling money in the stock market after being wiped out by the dot-com crash. As a result, they missed out on the extraordinary gains of the past seven years. Many of those who traded up in the housing bubble of 2000-2008 and took on big mortgages found that the recovery in housing prices has at best restored their marginal equity but hasn't enriched them (with the exception of those who managed to buy in Manhattan, West L.A., San Francisco, etc., where gains have now exceeded the 2007 highs). 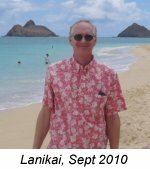 Millions of households that do not own homes in these hyper-hot globally attractive (and relatively small) markets are either still under water (they owe more than the home is worth after commissions and closing costs), or their equity is so limited that it doesn't create a "wealth effect." 4. 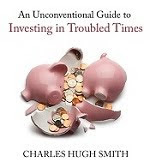 None of the structural problems that triggered the 2008 Global Financial Meltdown have actually been fixed. I don't mean risky banking or lending fraud, as destructive as these were--I mean the demographics that have mooted the entire financial foundation of pensions, the rise in healthcare costs (let's estimate 750 million Baby Boomers globally are going to retire and need more medical care--75 million in the US alone), the unstoppable rise of automation that replaces human labor, the environmental disasters that have been papered over but not actually solved--the list is long. 5. 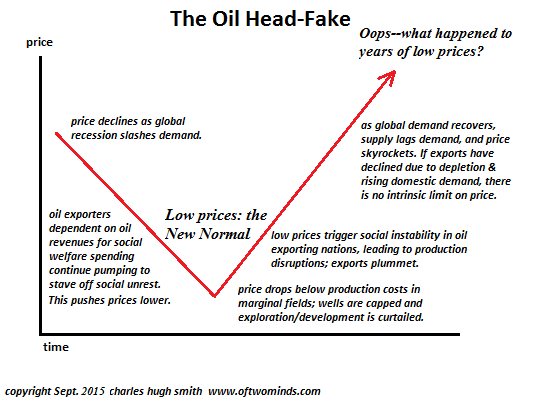 The Oil Head-Fake I have often described is playing out. As demand plummets, oil producers have no choice but to keep producing to service their debts or fund their social welfare program costs. This sets up a mismatch in demand and supply that has pushed energy prices lower, gutting the budgets of oil exporters and crushing their currencies. So the question going forward is: can the stock market completely ignore these changes and keep powering higher on the fumes of Mario Draghi's promises and another rate cut or three in China? 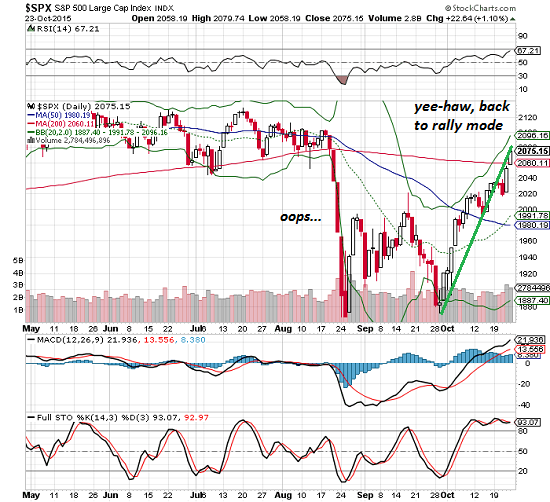 At some point reality will trump fumes, and the manic rally will falter and the mania in stocks will end in tears. Thank you, Scott B. ($5), for your most generous contribution to this site -- I am greatly honored by your support and readership. Thank you, Richard F. ($50), for your superbly generous contribution to this site -- I am greatly honored by your support and readership. If conventional labor and finance capital have lost their scarcity value, then the era in which financialization reaped big profits is ending. 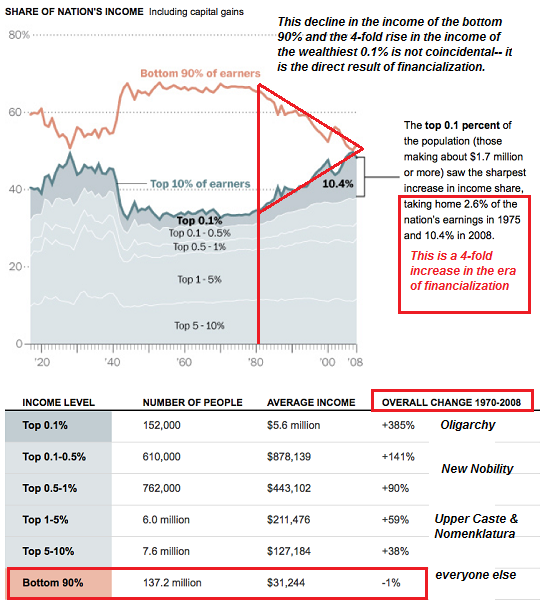 Why is wealth/income inequality soaring? The easy answer is of course the infinite greed of Wall Street fat-cats and the politicos they buy/own. But greed can't be the only factor, for greed is hardly unknown in the bottom 90%. The only difference between the guy who took out a liar loan to buy a house he couldn't afford so he could flip it for a fat profit and the mortgage broker who instructed him on how to scam the system and the crooked banker dumping toxic mortgage-backed securities on the Widows and Orphans Fund of Norway is the scale of the scam. The difference isn't greed, it's the ability to avoid the consequences or have the taxpayers eat the losses, i.e. moral hazard. The bottom 90%er with the liar loan mortgage and the flip-this-house strategy eventually suffered the consequences when Housing Bubble 1.0 blew up in spectacular fashion. Moral hazard describes the difference between decisions made by those with skin in the game, i.e. those who will absorb the losses from their bets that go south, and those who've transferred the risks and losses to others. The too-big-to-fail banks that bought political protection simply shifted the losses to taxpayers. Then the Federal Reserve helpfully paid banks for deposits at the Fed while reducing the amount banks had to pay on depositors' savings to near-zero, effectively rewarding the banks with free money for ripping off the taxpayers. America's financialized cartel-state system institutionalizes moral hazard. 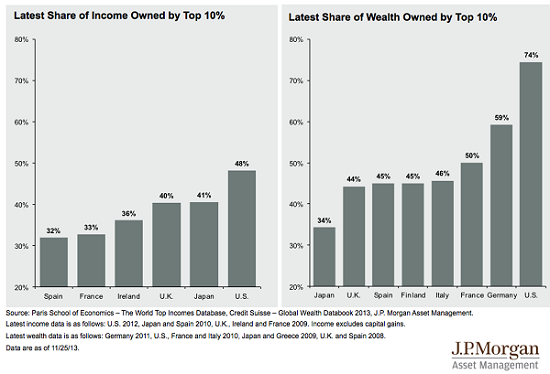 This is one cause of rising inequality, as the super-wealthy are immunized by their purchase of political influence. 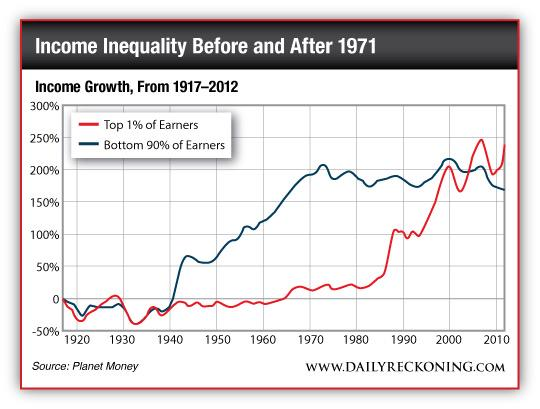 But that may not be enough to describe the decades of stagnation in incomes of the bottom 90%. The U.S. economy (along with the global economy) is undergoing a sea change equivalent to an industrial revolution, only this time it isn't just industrial, it's digital. What's scarce is changing, and since profits flow to what's scarce, that's upending the whole chain of value creation. As Erik Brynjolfsson, Andrew McAfee, and Michael Spence explain in their 2014 article New World Order: Labor, Capital, and Ideas in the Power Law Economy, the gains from the digital economy follow a power law distribution: the few at the top reap the majority of the gains while the dregs are distributed to the majority below. This is akin to the Pareto Distribution, something I have mentioned here many times over the years. This is also known as the 80/20 rule, as the top 20% typically gather 80% of whatever economic unit is being measured: land, sales, etc. The 80/20 rule distills down to the 64/4 rule, as 80% of 80 is 64 and 20% of 20 is 4:the top 4% reap 64% of the gains. Spence et al. 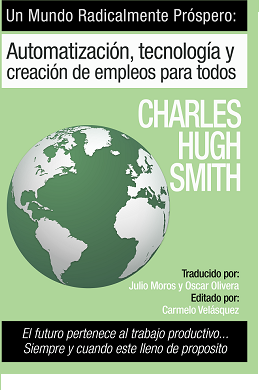 : Machines are substituting for more types of human labor than ever before. As they replicate themselves, they are also creating more capital. This means that the real winners of the future will not be the providers of cheap labor or the owners of ordinary capital, both of whom will be increasingly squeezed by automation. Fortune will instead favor a third group: those who can innovate and create new products, services, and business models. The distribution of income for this creative class typically takes the form of a power law, with a small number of winners capturing most of the rewards and a long tail consisting of the rest of the participants. 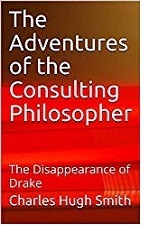 So in the future, ideas will be the real scarce inputs in the world -- scarcer than both labor and capital -- and the few who provide good ideas will reap huge rewards. Higher education is one example of the declining scarcity value of old models of labor and capital. When college degrees were scarce, college graduates commanded a high scarcity value. Now that tens of millions of people have degrees, the scarcity value is falling dramatically. In response, people have worked their way up the academic food chain, earning masters degrees and PhDs. But now many of these advanced degrees are also over-abundant, and the scarcity value of MBAs, etc. is declining. These realities will have major impacts. If conventional labor and finance capital have lost their scarcity value, then the era in which financialization reaped big profits is ending. If labor has little scarcity value, and productive ideas are what's now scarce, then what has leverage isn't a college degree--it's the ability to move across multiple fields of knowledge, learning new skills and seeking out new collaborations--the attributes of what I call mobile creatives, a new class I describe in my book Get a Job, Build a Real Career and Defy a Bewildering Economy. We can't wait around hoping the Power Elites relinquish their lock on monetary and political power: we have to individually seek out what's scarce in the emerging economy and learn the skills and make the connections to move up the value creation scale on our own power. Thank you, Susan B. ($50), for your monumentally generous contribution to this site -- I am greatly honored by your support and readership. Thank you, Gerard F. ($50), for your splendidly generous contribution to this site -- I am greatly honored by your support and readership.